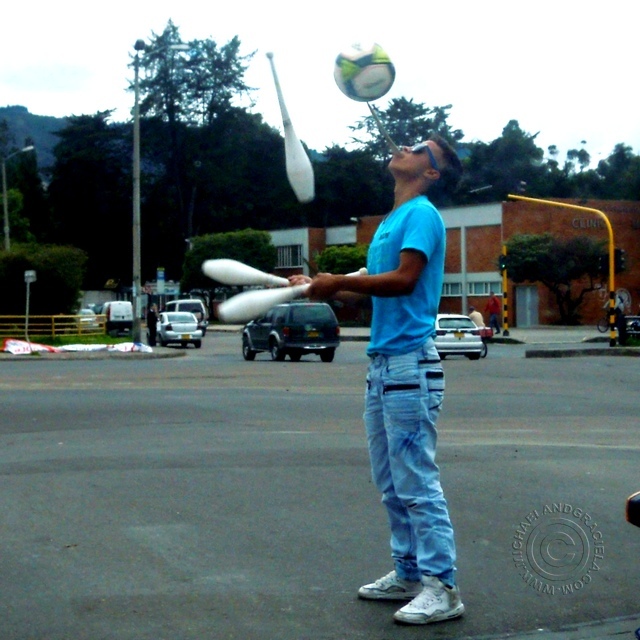 Michael: In Bogotá it is not unusual to see street performers at busy intersections. They entertain the first few cars while the light is red. Before green hits they walk between the cars collecting what coins the drivers wish to give them. Some of these performers actually put on an excellent short show. I have seen jugglers exhibit the skill only previously seen on stage by such acts as The Flying Karamazov Brothers. The most impressive so far, for me, has been three guys who stand on each other’s shoulders like a totem pole, walk from the side of the street to the middle, then juggle with machetes and fire lit torches. Graciela: It is difficult work. If people give anything at all it is usually just a few coins the equivalent of which is 5 cents to 10 cents. It is not a get rich quick thing for the actors. I give all of them credit for at least trying to make money.